Exceptional landscaping does more than make a good impression. It's a gift to everyone who sees it. In addition, beautiful landscaping invites you outdoors and creates a perfect setting for socializing. Everyone wants beautiful outdoor living spaces, but it's easy to miss the mark. Don't make the following 4 mistakes when planning outdoor living spaces. 1. Forgetting the master plan. Beautiful outdoor living spaces don't just happen. They're designed for specific locales and then executed flawlessly. When you begin with a master plan, each element fits into its appointed space. A well-designed master plan takes seasonal changes into account, and it anticipates the growth of plants and trees over time. Even if you're not planning on developing your plan all at once, you should have the plan in place. For example, perhaps an outdoor fireplace is part of your plan but you're not going to build it for another 3-4 years. With a master plan in mind, you won't forget and plant a tree this year in the perfect spot for the fireplace. 2. Failing to consider the impact of environmental elements and selecting the wrong materials. 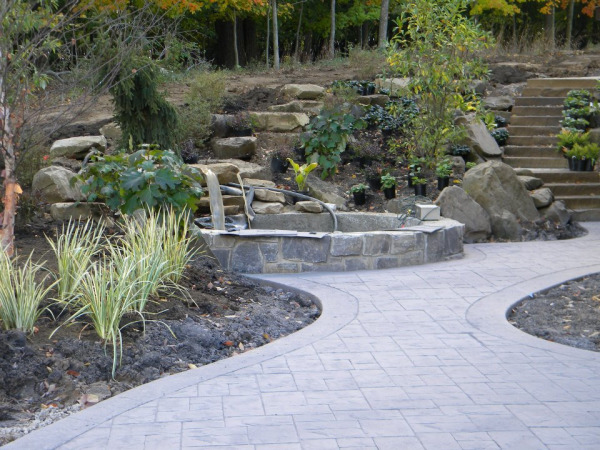 If you're developing your living space on the shores of Lake Erie, you'll want to use hardscape stone and concrete products in your landscaping design. If you use wood simply for aesthetic reasons, you will find yourself scraping, sanding, staining, and re-sealing for many years instead of enjoying your outdoor living space with your family and friends. In addition, it's important to consider the ideal growing conditions of the plants you select. It's a shame to plant a prized specimen in a place that it simply cannot thrive. 3. Neglecting to determine a budget. It's not uncommon for homeowners to embark on a lofty landscaping project without thinking about how much the improvements will cost, especially if they plan to execute their design in stages. Wise homeowners start their project with a predetermined budget. Settle on your budget before you make a single choice about what your landscaping will look like, and you will be much happier with the overall results. You'd hate to resent your beautiful outdoor living spaces just because they cost you more than you anticipated. 4. Failing to properly research the landscaping company you hire. There are vast differences in quality of landscaping companies. Some companies pop up overnight just to go out of business several months later. Others have been in business for many years but fail to stay current with important technological developments. You'll even find companies that get your business and then subcontract out the work to another company you've never heard of! You'll get the best results if you hire a landscaping company with years of experience, a variety of services, and a long list of satisfied customers. We have the experience, the up-to-date skills, and the long list of satisfied customers. In addition, we prefer to collaborate with clients about their landscaping projects because our customers are the ones who will live with their beautiful outdoor living spaces year in, year out. We never walk into a project thinking that we know what's best for a client. We listen attentively and work with our clients to make sure their landscaping is all they hoped it would be--and more. Don't make these 4 mistakes when planning your outdoor living spaces. Begin with a master plan, take your environmental factors into consideration, set a predetermined budget, and hire a company that will listen to your ideas, make a professional plan, and follow through with all of their promises. If you do, your landscaping will be exceptional.